In June 2017, the city of Oshkosh received the final Wisconsin DNR approval of the remediation of the former Mercury Marine facility on the Fox River. In 2006, the city acquired the closed facility from Mercury Marine with hopes to convert the property into a new and improved community asset. The city used EPA brownfields grants for assessment and cleanup work on the properties as well as state, city, and private funding. 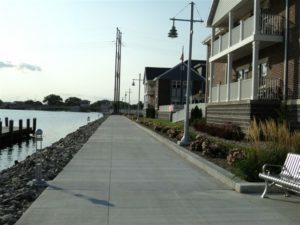 A new riverwalk provides additional community access to the waterfront. This property housed industrial facilities since the mid-1800s. Past uses of the land include a lumber business, candle company, and a bulk fuel tank farm. The site was then owned by the Kiekhaefer Aeromarine Company who then sold it to Mercury Marine in the mid-1970s. A range of contamination types were identified at the site as well as several feet of waste fill across the entire property. Metals, petroleum contamination, and chlorinated compounds were identified in the soil and groundwater. The city removed much of the contamination while using buildings and parking lots to serve as a cover over the residual contaminated soil. In addition, the cleanup included an innovative approach where they left one area of heavily contaminated soil under a newly created, city owned, small park. This park serves as a protective barrier, saves project funds and creates additional public green space. This park connects to a new public riverwalk and piers along the river. The city partnered with a private developer to build three high quality apartment buildings, two specifically for senior residents. The site went through the DNR’s Voluntary Party Liability Exemption (VPLE) program and received a Certificate of Completion in August 2017 which provides liability protections for current and future property owners.